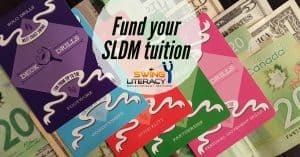 Pay your SLDM Theory Module tuition in installments over 3 months. Details listed on the product page before checkout here. By registering as an “Affiliate”, when customers you refer click on your customized referral link or mention your name at checkout to purchase a Deck of Drills, you will get $20 credit per Deck. On the Affiliate Area page, you will be able to view your referrals and track your accumulating credit. Note: This does delay your access to the program. Access will be granted once your tuition is paid for via credit or a combination of credit and direct payment.